Gender is the social, behavioral, and cultural attributes, expectations, and norms associated with being a woman or a man. The aim of gender equality is the empowerment of women, thus enabling them to manage their lives. Gender equality is a fundamental issue. The lives of people are heavily influenced by the societal stereotyping of gender. While there are differences in the biological makeup of men and women, the gender roles that are played are determined both socially and culturally. Despite major changes in the attitudes of people over the years, the issue of gender is still very much alive in society today. Gender inequalities impact women over their lifetime, their health, educational attainment, and economic conditions. Gender equality will be achieved only when women and men enjoy the same opportunities, rights, and obligations in all spheres of life. The paper is a study on the existing literature on gender and equality to understand the existing social and psychological paradigms that act as a barrier to equality among the different genders. The present study aims at understanding an overall picture of the psychosocial paradigms that infringe on gender equality. Journal articles and texts on gender inequality were identified and reviewed. psychological, sociological, and psychosocial perspectives of gender inequality are presented in the paper. Gender inequality in health, education, and work is present to date. In this systematic review, we summarize the current understanding and controversies on cognitive sequelae after traumatic brain injury (TBI) to understand the cognitive deficits such as memory, attention, executive functions, and unawareness of their deficits in TBI patients. This review presents the cognitive sequel of patients with moderate-to-severe TBI by a comprehensive focused conglomeration of research publications by searching various resources. A search strategy with specific inclusion criteria was performed in PubMed, Cochrane, Web of Science, and the WHO Global Health Library. This review noted that TBI is related with increase of various neurological and non-neurological disorders including problems with attention, inability to concentrate, speech and language dysfunctions, learning and memory impairment, impaired reasoning, impaired planning and problem-solving. This review found that patients' cognitive deficits are common in victims of moderate to severe TBI often as the long-lasting sequalae. The present review suggests that there is a need for further research to develop unique rehabilitation methods that will help to enhance brain plasticity and process of recovery after TBI. Background: The objective of this review is to discuss the current advancements, and critical issues, in the area of studying disturbances of self in schizophrenia. The critical and systematic review of the self in schizophrenia is significant because it has been regarded as a prodrome and a predictor of the development of future psychosis. In addition, it has been found to be over and above clinical symptoms and is common in people with schizophrenia. Methodology: A systematic electronic literature search was done using PubMed, MEDLINE, and PMC (PubMed Central) databases were searched systematically, and relevant articles published in English peer-reviewed journals were selected. Results: The findings were discussed, and critical analysis of the studies revealed methodological and conceptual issues in the literature studying self in schizophrenia. Conclusion: The review has concluded with the discussion on future directions in terms of research and clinical applications. Aims and Objectives: The aim of this study was to assess the knowledge of psychiatric aspects of alcohol use disorders (AUDs) in medical students. Materials and Methods: A cross-sectional study conducted in Mamata Medical College, Khammam, Telangana, from June 2014 to May 2015. The study sample consisted of 180 medical students (115 final year and 65 interns), who agreed to answer the Knowledge of Psychiatric Aspects of Alcohol Questionnaire (KPAAQ) anonymously, indicating their gender, year of study and whether they had attended any lecture or workshop on alcohol. KPAAQ consists of 50 questions of 6 clinically relevant categories. Each response to 50 questions of the KPAAQ was assessed. Each correct response was awarded 2 points, thereby, yielding a possible range from 0 to 100 points. Results: The mean knowledge score in medical students was 44.53 (standard deviation = 11.23) without any significant differences (t = 1.171; P > 0.05) between final year students and interns, while the mean knowledge score was significantly more in 74 male students when compared to 106 female students (46.62 ± 10.58; 43.07 ± 11.49) (t = 2.103; P < 0.037). Conclusions: Irrespective of their year of study. Knowledge of psychiatric aspects of AUDs in medical students was inadequate. Background: A caregiver is an individual who provides assistance and assumes the responsibility for the physical and emotional needs of another individual who is incapable of self-care. Caregiver burden is a universal phenomenon and more than half of the caregivers experience burden in their role as caregivers. There is a paucity of studies to understand the burden and coping strategies of caregivers in chronic psychiatric illness and chronic medical illnesses, especially in the Indian scenario. Aims and Objectives: (i) To compare the caregiver burden in chronic psychiatric illness and chronic medical illness (ii) To compare the caregiver efficacy in chronic psychiatric illness and chronic medical illness. Materials and Methods: The study sample included caregivers of inpatients admitted in a tertiary care hospital in South India. A total of 120 caregivers were included in the study with 60 caregivers from psychiatric ward and medicine ward, respectively. The caregivers were then assessed using the Caregiver Burden Scale and the Revised Caregiver Self-efficacy Scale Results and Conclusion: We found that majority of the caregivers were first-degree relatives and women constituted a major part of the caregiver group. Caregiver burden was significantly higher in psychiatric illnesses compared to medical illnesses. Caregiver efficacy was similar in both study groups. Interventions to reduce caregiver burden and to improve caregiver efficacy should be implemented to ensure optimal management of both patient and caregiver. Aims and Objectives: The present study is an attempt to study strengths-difficulties, and experiences of loneliness in below poverty line (BPL) and above poverty line (APL) children and compared the same between two groups. Materials and Methods: The total sample consisted of 120 participants (age range 10–13 years), 60 BPL and 60 APL children. Each group further consisted of 25 females and 35 males. The samples were drawn using convenience sampling method. Strengths and difficulties questionnaire (SDQ) and loneliness and social dissatisfaction scale were the tools used. Results: In BPL children, peer problems were found to be the highest (i.e. 25% in abnormal and 55% in borderline range). Significant difference was found between BPL and APL children on emotional symptoms (P = 0.003), peer problems (P = 0.02), and prosocial behavior (P = 0.03), on SDQ, and experiences of loneliness (P = 0.04) on loneliness and social dissatisfaction questionnaire. The significant negative correlation was found between loneliness score and emotional symptoms score (P = 0.03), loneliness score and hyperactivity score (P = 0.002), and between loneliness score and peer problems score (P = 0.001). The significant positive correlation was found between experiences of loneliness score and prosocial behavior score (P = 0.03). Conclusions: In BPL children, peer problems were found to be the highest. BPL children have more emotional symptoms, peer problems, and feeling more lonely compared to APL children. APL children have low prosocial behavior. Children with more emotional symptoms, peer problems, and hyperactivity are feeling lonely. Children with low prosocial behavior are feeling lonely. Objective: The objective was to study the reasons for referral, to study diagnostic categories of psychiatric referrals, and to study the associations if any between reasons for referral and diagnostic categories of psychiatric referrals. Materials and Methods: The present study was conducted at the Department of Psychiatry, Mamata General Hospital, Khammam. The present study consists of 112 psychiatric referrals; 12 referrals were excluded from the study as they are not willing to give consent, so the study was conducted on 100 psychiatric referrals. The study protocol was approved by the Institutional Ethics Committee. 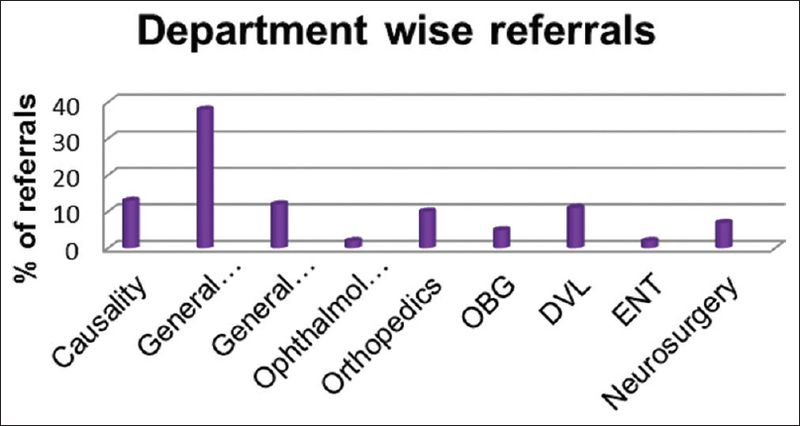 Results: In the present study, based on the sources of referrals, it was found that majority of the patients were from the Department of General Medicine (38%). In the present study, the most common reason stated for referral was suicidal/self-harm act by 29% of the sample. The most common psychiatric disorder diagnosed in the present study was found to be substance use disorder which is seen in 33% of the sample. On evaluation of diagnostic categories with reference to reasons for referral, it is found that most of the referrals with a history of excessive alcohol intake were diagnosed as substance use disorders (91.6%). Majority of referrals with a history of suicidal attempts were diagnosed as intentional self-harm (58.6%). Referrals with a history of altered sensorium were diagnosed with organic mental disorders (50%), substance use disorder (37.5%), and 12.5% had no psychopathology. Conclusion: Suicidal attempts are most commonly diagnosed to have intentional self-harm. Substance use disorder came to be high in referrals which are referred for excessive alcohol intake. Regarding referrals to psychiatry department, majority of the patients were from the Department of General Medicine. The most common reason stated for referral to psychiatry was suicidal/self-harm. Background: Police personnel form an important occupational group who constantly work under stressful situations. Preventive programs in the government organizations and studies investigating the occupational stress among police officers in India, particularly in the state of Andhra Pradesh, are still limited. Materials and Methods: Demographic details such as age, educational qualification, years of service, and number of children etc of Demographic details such as age, educational qualification, years of service, and number of children etc of Male police constables (n = 123) working in the Bellampalli subdivision of Adilabad district of erstwhile Andhra Pradesh were captured. Details of height, weight, body mass index (BMI, kg/m2), blood pressure (BP), pulse, the status of addiction, and type of illness were extracted from the records. Descriptive statistics were calculated, and Chi-square test to find an association between categorical variables was performed using SPSS version 16. Results: About 72.4% of the constables were addicted to at least one habit such as alcohol consumption, smoking, and chewing smokeless tobacco and pan. Nearly 20.3% were addicted to chewing tobacco/pan followed by addition to alcohol consumption 14.6%. With the increase in age, the prevalence of hypertension also increased showing a significant association (systolic BP [SBP]: P = 0.001; diastolic BP [DBP]: P = 0.001). Similarly, higher BMI (SBP: P = 0.008; DBP: P = 0.001) and increased number of service years (SBP: P = 0.001; DBP: P = 0.001) were associated with higher prevalence of hypertension. Conclusion: Developing an adequate evaluation of the association between chronic diseases and mortality in addition to a hazard surveillance system for tracking the risks for occupational injury and illness among police officers should be considered. Introduction: Professional quality of life (ProQOL) is the measure that everyone feels in relation to their work. Both the positive and negative aspects of doing a job, influence the ProQOL. The majority of people spend more time at work than they do anywhere else, doing anything else. Aims and Objectives: The aim of this research is to study the relationship between ProQOL and general health in the postgraduates of a tertiary care hospital. Methodology: This is a cross-sectional study, which is conducted at Mamata General Hospital in Khammam, Telangana during a 6-month period (2017). The tools used are the ProQOL questionnaire and general health questionnaire. Results: Statistical analysis needs to be done, and the results will be analyzed and presented later. Conclusion: The current study is carried out to support the findings between the ProQOL and general health among postgraduates at a tertiary care hospital. Background: Nutrition and depression among elderly have emerged as a major public-health problem, and depression is one of the leading causes of disease burden worldwide. The evidence shows that more than 50% of the elderly population is underweight and more than 90% has an energy intake below the recommended intake. Objective: The objective of this study is to determine the prevalence and correlates of malnutrition and the relationship with disability and psychological well-being, and to assess the pattern of morbidity, co-morbidity, among the elderly in Udupi taluk of Karnataka. Methodology: This cross-sectional study conducted during January–June 2017 included 570 participants of ≥60 years of age. The data were analyzed for percentages, mean, and standard deviation. The tests of significance such as analysis of variance and Independent t-test were used; P < 0.05 was considered statistically significant. Results: It was observed during the study that the majority belonged to the young old age group (63.2%), were financially dependent (55.8%) and most of them are from rural (61. 1%). The prevalence of malnutrition based on the malnutrition indicator score was found to be (11.22%) and (44.73%) are at risk of malnutrition. The mid-upper arm circumference and calf circumference measurements were (8.24%) and (11. 75%), respectively. The prevalence of depression in the elderly was found to be 6.6%. Conclusion: The care of the elderly should also include the nutrition and mental healthcare components for better addressal of the health needs of elderly which requires to be brought on the national health care agenda. Background: Perception of the people about mental illness will have a substantial impact on the treatment outcome and quality of life of people affected since it greatly influences the identification, help-seeking behavior, and stigma attached to it. To realize the goal of community-based mental health care, community needs to be educated on mental health issues. Aims: The aim of the study is to ascertain the sociodemographic profile of the members enrolled in self-help group (SHG) and their orientation toward mental illness (OMI). 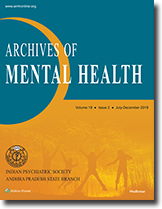 Materials and Methods: A cross-sectional research design was employed to assess the orientation of SHG members toward mental illness using OMI scale. Descriptive statistics and nonparametric tests were used for the analysis of the data. Results: Overall, participants obtained score of 212.50 which was above than the cutoff score, indicating unfavorable orientation to mental illness. Conclusion: Assessing and orienting the members of SHGs on mental health issues will aid in addressing the need to include an economic empowerment and social inclusion component while scaling up of mental health services in low- and middle-income countries. Further intervention model that is acceptable to the local community needs to be developed, and the efficacy of such intervention programs needs to be tested scientifically. Objective: The aim was to study about the sexual dysfunctional beliefs among male and female medical students and analyze the factors in which the beliefs are more obvious. Materials and Methods: The present study was conducted among male and female interns in Mamata General Hospital, Khammam. The present study consists of 156 participants, 68 students were excluded from the study as they are not willing to give consent, so the study was conducted on 88 students. The study was conducted using “sexual dysfunctional beliefs questionnaire – male and female versions.” The study protocol was approved by the Institutional Ethics Committee. Results: Sexual dysfunctional beliefs among females and males showed significance of P value. In females, there is a significant positive correlation among all the variables and whereas in males, there is both significant positive correlation and negative correlation among the variables. Conclusion: Overall, findings in the current study population suggest that dysfunctional sexual beliefs are more in men than in women. In males, “Macho belief” is more evident than other factors and whereas in females, it is sexual conservatism. Introduction: Medical students face a number of stressors because of time pressure, which affects their academic performance and quality of life. Previous studies have shown that coping reduce the level of stress among medical students. Aim: The aim of this study was to assess the level of stress and coping mechanism among medical students. Methods: In this cross-sectional study, 200 first-year medical students at Jawaharlal Nehru Medical College, Aligarh Muslim University, Aligarh, Uttar Pradesh (130 males and 70 females), were invited to fill in a self-administered questionnaire in the 2017–2018 academic year. The questionnaire comprised of 12 items on stress factors and 10 items on coping strategies. The responses were measured quantitatively on a five-point Likert scale. Result and Discussion: The response rate was high. Different stress factors and coping strategies were identified by students. The prevalence of perceived stress among medical students was high. This might affect not only their academic performance but also other aspects of their life as well. There is a wide range of strategies for coping with stress that could play an important role in helping students to cope with stress. 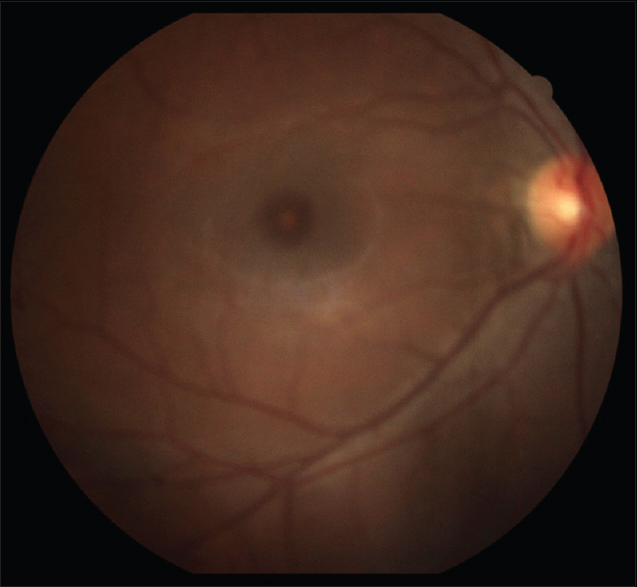 Solar retinopathy is a rare complication of damage to the retina due to unnatural exposure to bright light. Few cases have been reported in international literature in special groups like in children, psychiatric patients, direct gazing of solar eclipse and in certain occupations like arc welding. Of the few that are reported in mental institutions, majority had a diagnoses of schizophrenia. Along with the review of the reported cases, we report the first case of solar retinopathy in a patient who indulged in sun gazing during acute manic phase in our country.